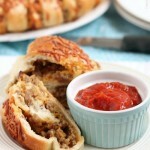 Meatball Sandwich Pizza - Dessert Now, Dinner Later! 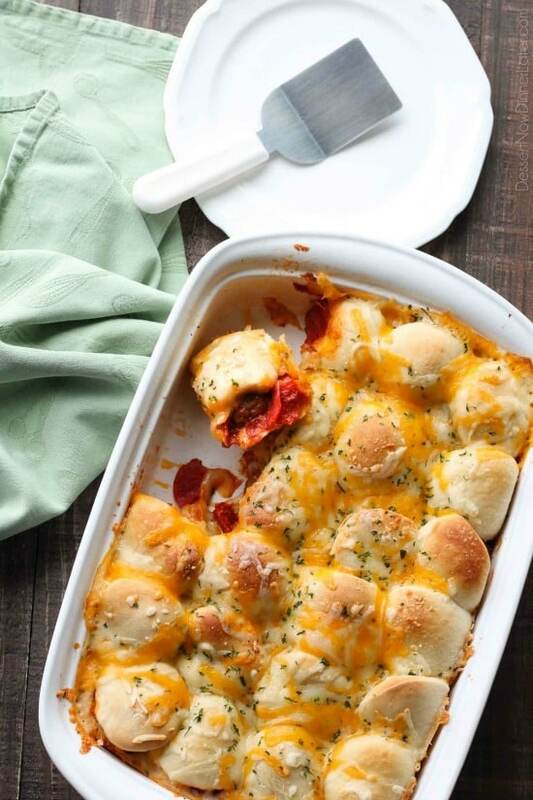 This deep dish casserole is a meatball sandwich and pizza in one! 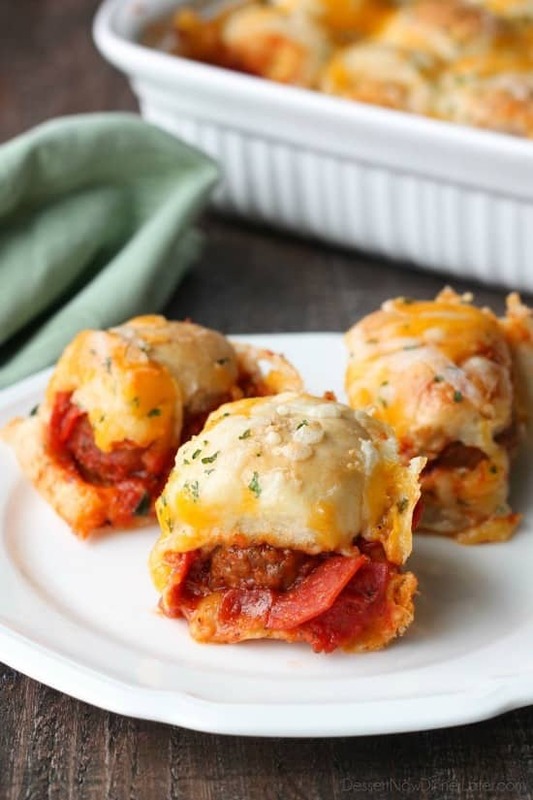 Saucy meatballs and pieces of pepperoni are sandwiched between fresh bread and topped with cheese for a hearty dinner, party appetizer, or sports game snack. The holidays are over, but it’s still winter, so hot food is a must! 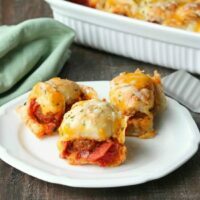 I whipped up this dish that is a combination of a meatball sandwich and deep dish pizza in one, and it was perfectly meaty and cheesy and something the whole family enjoyed! 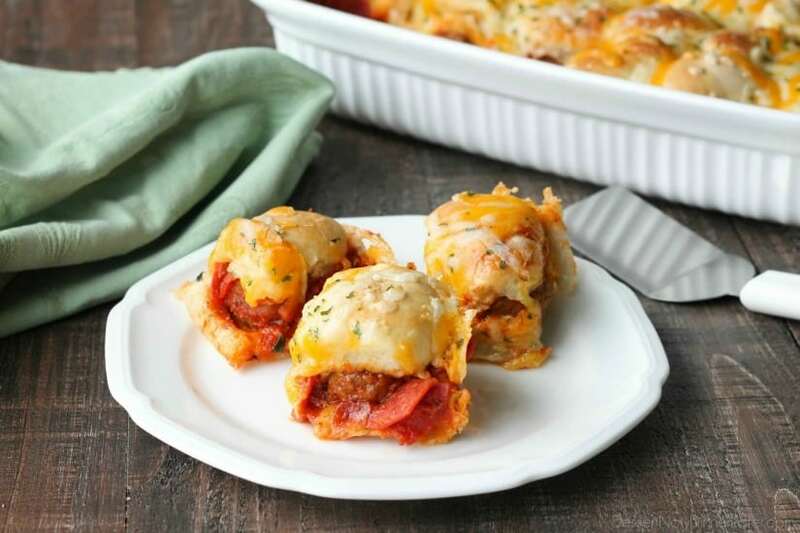 This Meatball Sandwich Pizza is almost like those slider-casseroles you see on Pinterest and Facebook, but this one is made with fresh dough that bakes right along with the filling. Who doesn’t love fresh bread, hot from the oven?! That’s what I thought. 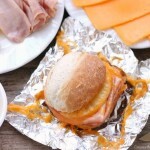 There is Parmesan cheese in the middle with the meaty, saucy mixture, and then more cheese goes on top. 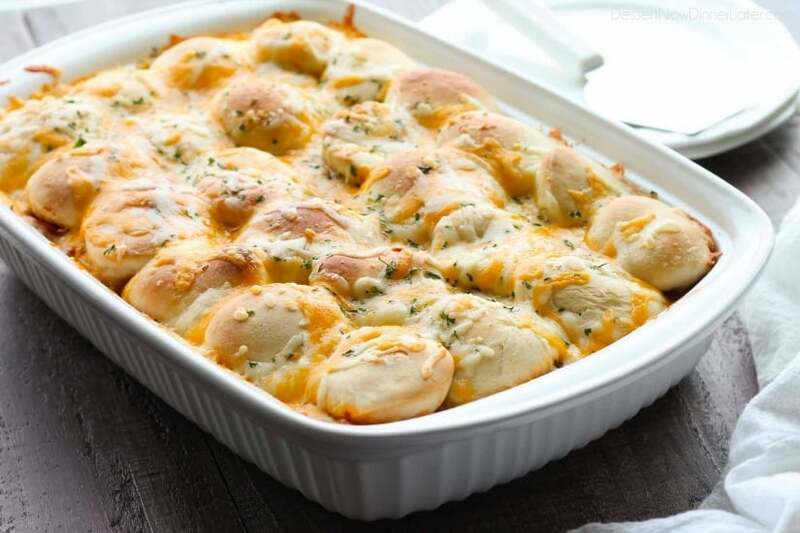 It’s ultimate casserole pleasure. 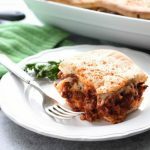 This recipe is perfect for the whole family. I can also see “the guys” downing this Meatball Sandwich Pizza during the football game. It’s total man food. Pretty much anyone who is hungry would enjoy this. Try it! 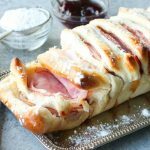 Cut rolls in half. Press half of the cut rolls into 3-inch circles onto the bottom of a sprayed 9x13 inch baking dish in 4 rows of 6. Press together to make sure the bottom of the pan is completely covered. Combine pizza sauce and frozen meatballs and microwave about 8 minutes until sauce is bubbling and meatballs are thawed through. Add chopped pepperoni and mix well. Pour mixture evenly over dough pieces in pan. Sprinkle with Parmesan cheese. Flatten and place the remaining dough halves on top of the mixture in 4 rows of 6. Cover with sprayed plastic wrap and let rise until dough doubles on top. Remove plastic and bake at 350 degrees Fahrenheit for 12 to 18 minutes. Cover with foil if needed to prevent over browning but make sure dough is baked through. Remove from oven and sprinkle with cheese blend. Bake an additional 5 minutes or until cheese is nicely melted.